With the cool front that arrived last weekend, the crisp mornings provided us a delightful surprise after the record breaking heat. Apparently Autumn has truly arrived and it is with grateful sighs we are donning sweaters and having morning coffee outside again. Autumn is the time to plant spring blooming bulbs and divide those who have been in the same place for several years. After blooming flowering bulbs will produce offspring as a miniature bulb springing from the adult. Over time some bulbs will experience overcrowding as these baby bulbs grow and these close quarters will often produce lack luster flowering. In particular, Amaryllis Belladonna, the lovely Naked Ladies, must be divided every three or four years… since this fabulous bulb may live to seventy years her decent lodging is well deserved. To divide them use a garden fork which will not cause as much damage to the roots as a spade… dig at the mound-edge in a large circular pattern. Begin to gently lift, easing the mass from the ground, attempting to get most of the attached roots. Rinse the mass of bulbs and begin by carefully separating the entwined roots. Once they are divided, separate the smaller bulbs from the larger by placing them in two piles. Trim off any yellow or unhealthy foliage but leave healthy, green foliage attached. While the bulbs are out of their bed, turn the soil and incorporate compost, rotted manure or peat moss to enrich it even if you are planting them back from whence they came. Replant the largest bulbs with soil about two inches above the crest… planting too deeply will decrease flowering. 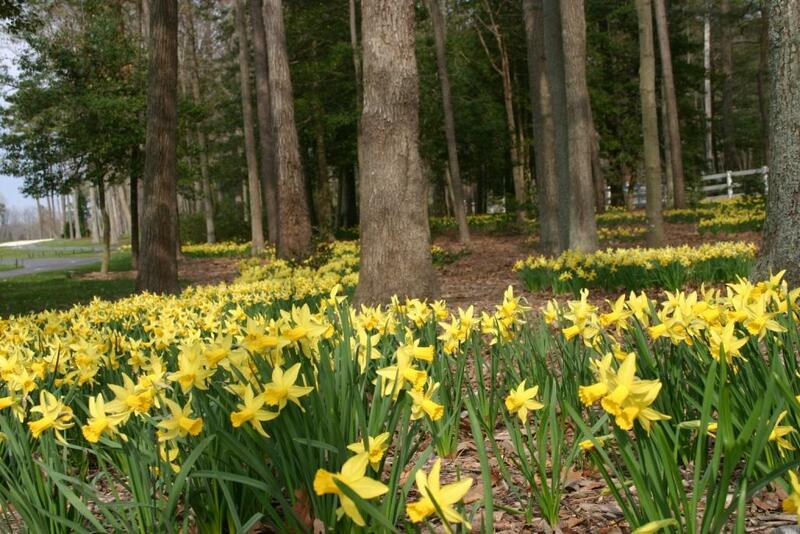 Bulbs appear their best spaced about 8 inches apart, planted in clumps of three or more. Select a new spot in the garden to plant the smaller bulbs and do not expect them to flower the first year for it will take a bit of time for them to become flowering adults. 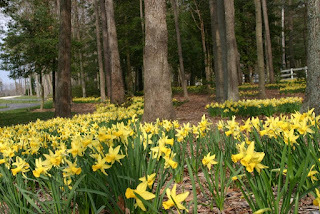 The exception to the rule of bulb division is the Jonquil and Daffodil who grow outward instead of intertwining, thus making them perfect for naturalization. Naturalizing is the process by which undisturbed bulbs quietly spread until they have evolved into a large and spectacular show. Since one bulb eventually becomes ten or more they should to be planted with enough room to spread, planting them in any location a surprising spot of spring beauty will be appreciated. To naturalize with spontaneity, randomly toss the bulbs and plant them where they have landed… a large display is truly show-stopping. Now is the time to plant them!